Nature. Boston: James Munroe and Company, 1836. 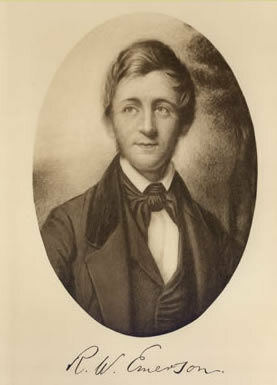 Ralph Waldo Emerson was a philosopher and writer, and champion of the Transcendentalist movement, which emphasizes the continuity between man, nature, and the divine. In Nature, Emerson expounds on the intermediary role nature plays between man and a greater spirit of the world. Emerson thought that "the reason why the world lacks unity, and lies broken and in heaps, is because man is disunited with himself. He cannot be a naturalist, until he satisfies all the demands of the spirit." Beauty and language are all served by nature in Emerson's mind. Men like Henry David Thoreau and John Muir were influenced by Nature, and even industrialist Henry Ford praised Emerson's philosophy.